A two-year joint ESA and UNESCO project to chart the habitats of endangered mountain gorillas with satellites came to a fruitful finish in Paris, as end-users received final maps and geographical data products for use in the field. "These maps will help us make our anti-poaching efforts more effective," said Eulalie Bashige, Director General of the Institut Congolais pour la Conservation de la Nature (ICCN) of the Democratic Republic of Congo (DRC). "We can also clarify the exact location of our national park boundaries, improve our biological inventories of the parks, and plan out gorilla eco-tourism." Less than 700 mountain gorillas remain alive, found in highland forests that straddle the borders between Rwanda, Uganda and the DRC. These regions make up a set of five national parks; three of these have been designated World Heritage Sires by the United Nations Educational Scientific and Cultural Organisation (UNESCO), while the remaining two have been nominated for the same status. A pair of Landsat satellite images have been used to identify land cover change occurring between 1987 and 2003 in the Virunga massif in the Democratic Republic of Congo. The changes seen are highlighted in coded colours: light blue shows non-forest to closed canopy forest - an example of new forest growth - while purple stands for the opposite, closed canopy forest to non-forest. Red corresponds to newly urbanised areas and yellow stands for other changes. The parks have long boundaries that run across inaccessible and hardly mapped territory, with no compatible maps available across national borders. An influx of refugees into the area in recent years has led to illegal forest clearing for agriculture or fuel, as well as illegal poaching for food, reducing the living space left for the gorillas. ESA and UNESCO have been working together on a project called Build Environment for Gorilla (BEGo) to precisely chart the region in order to help national conservation agencies and non-governmental organisations working in and around the parks. 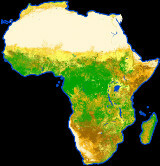 During a 7 April meeting at ESA Headquarters in Paris, BEGo partners and end-users including the ICCN, Uganda's Institute of Tropical Forest Conservation (ITFC) and the International Gorilla Conservation Programme (IGCP) received the final outputs of the project â€“ map products and layers for use in standard geo-information system (GIS) software. "This project is a result of the Open Initiative agreed by ESA and UNESCO in Toulouse in 2001, to apply space technologies to support the World Heritage Convention," said Jean-Paul Poncelet, ESA Director of External Relations. "BEGo has been a user-oriented project, aimed at providing not just maps but a complete cost-effective information service to support UNESCO, the national authorities and the non-governmental organisations working in these places. A virtual 'overflight' of Volcanoes National Park in Rwanda, based on the new Build Environment for Gorilla (BEGo) data products produced for the area. These include a digital elevation model (DEM) of the area, land cover map and base map, all of which will be used to enhance efforts to conserve mountain gorillas in the Park and its surroundings. These maps - plus the satellite imagery they are based on - are shown here draped over the DEM. Similar satellite-derived map products are being produced for other mountain gorilla habitats across Central Africa, several of them UNESCO World Heritage Sites. Credits: ESA "This fruitful partnership is an example of the potential of space technology to support the implementation of the World Heritage Convention and conserve World Heritage sites worldwide. Preserving our common heritage is everybody's concern." Walter Erdelen, UNESCO Assistant Director General for Natural Sciences agreed that BEGo showed that the Open Initiative between the two organisations has produced real outcomes, but that the end of the project represented "only a beginning and not an end". He congratulated project participants for the dedication they had shown and said that now the governments of DRC, Rwanda and Congo could take the maps and all this information to better preserve the mountain gorillas and many other important species in the region. "After all this time and hard work it is exciting to get our hands on the finalised maps and products," said Maryke Gray, regional monitoring officer of the IGCP. She explained that the mapping could not have been done without Earth Observation, which provided an efficient, cost-effective and frequently updated means of surveying the most inaccessible regions of interest. The effect of large refugee camps in the vicinity could be clearly monitored, as could the impact on vegetation of volcanic activity. Combining the GIS layers provided by BEGo with GPS data collected in the field, gaps in existing anti-poacher patrol coverage could be identified and redressed, and the migration of gorilla groups could be followed across national boundaries. Five sites in Central Africa have been covered by BEGo activity: Uganda's Bwindi Impenetrable National Park World Heritage Site, the Kahuzi-Biega National Park World Heritage Site in DRC, Rwanda's Volcanoes National Park and â€“ running contigious with it - the Virunga National Park World Heritage Site in DRC and the Mgahinga Gorilla National Park in Uganda. 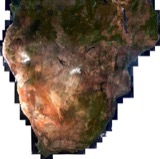 Satellite images have been used to produce detailed base maps across the five parks, Digital Elevation Models (DEMs) and maps of land-use and land-cover change from about 1990 onwards. Belgium's Royal Museum of Central Africa and the Catholic University of Louvain then validated the map prototypes, which were also evaluated on the ground during end-user fieldwork. BEGo was a service demonstration project taking place as part of ESA's Data User Element, with Netherlands-based Synoptics as prime contractor with Belgium-based Keyobs collecting user requirements and responsible for mapping. Mario HernÃ¡ndez of UNESCO's World Heritage List said that BEGo methodology could be replicated for other World Heritage sites in future. The Belgian Federal Science Policy Office is already backing an effort to use space technologies to map all World Heritage Sites in DRC.